My dad grew up in Upstate New York, said many times Billy Martin was clutch and stepped it up in postseason. Yeah, and the Red Sox, Braves and Giants couldn't win with Williams, Aaron or Mays. With all due respect.....all I am saying is, if you are going to compare stats you must compare World Series performances. And, Aaron played in only two W.S. As we all know, there were no League Play-off series in Mantle's timeframe. So, I will reprise the numbers which show only World Series stats for comparison of Aaron and Mantle. Mantle wins this contest in every category except forBA. win more Championships ? They certainly had some great players back then (Mathews, Adcock, Crandall, Spahn, Burdette, Buhl, etc., etc.). By your logic, Billy Martin was a better player than Ernie Banks. A team has many players, one of which may be a superstar. Sure, it helps a lot for the superstar to put up big numbers. But the rest of the big bunch counts for a whole lot more on a team trying to win rings. If I were to analyze it, I would start with the pitching, top to bottom, of Mantle's Yankees vs. Aaron, Mays, etc. teams. Pitching is a big factor if a team is going to go far. The Yankees "gelled" as a great team together, all components worked, Mantle was recognized as top dog, but the supporting cast was darn good and clutch overall. Again, ad nauseam, IF Williams, Aaron and Mays could've taken teams to World Series championships like Mantle did... They would have. It's simple. Again, Mantle did not single-handedly take his team to all those championships. In fact, most of the time he was not even named most valuable on his own team. Yet, look at the World Series records he holds.... They say you're wrong. And of course he was the most integral component to the Yankees success, whether you want to admit it or not. This thread feels like it's devolving into a cry to recognize yet another new and ridiculous stat. Let's call it MAR. MVPs Above Replacement, commonly abbreviated to MAR, is a non-standardized sabermetric baseball statistic developed to sum up "a player's total contributions to his team." A player's MAR value is claimed to be the number of additional MVP awards his teammates have received above the number of expected MVP awards his teammates would have won if that player were substituted with a replacement-level player: a player who may be added to the team for minimal cost and effort. Last edited by JollyElm; 04-14-2019 at 04:38 PM. Mays. The best I've ever seen. The Red Sox didn’t have any pitching, and I don’t see how that is the fault of their left fielder. The one year they did, they won 104 games and the pennant, as Williams won his first MVP. When Williams came up, their best pitcher was 39 year old Lefty Grove. After the war, once Ferriss and Hughson came up lame, they were carried by Mel Parnell (who himself was injured from 1952 onward) and Ellis Kinder, who didn’t break out until he was 35. Williams was a big part of the 1950 offense that scored 1,000 runs (he had 28 HRs in 89 games despite an elbow injury at the ASG that nagged him for the rest of his career). But that team finished in third, because they had one pitcher with an ERA below 4.00. Williams, Aaron and Mays simply did not have the talent around them the way that Mantle did, either in the lineup or on the mound. They did for short periods of time but not for the extended period of time during their careers as Mantle did. Same holds true for Trout. Can anyone argue that he's not the best player in baseball right now? But can he get his team to the postseason, even with the extra wild card spots? He can't, because he doesn't have the talent around him. He was in more World Series so of course he has bigger numbers. As far as him being the most integral part of his teams, your argument is not with me, it is with the sportswriters, who, yet again, 6 times out of 9, named one of Mickey's teammates, NOT Mickey, as being the most integral player responsible for the success of that season. I don't accept the premise that only World Series stats measure a player's value. If that was the case, then Billy Martin (5 WS home runs) was far better than Ted Williams, which is silly. For that matter, Mantle hit only .257 in the World Series with a .374 slugging average, while Martin hit .333 with .371 slugging average. Back to the original question, if I could have one of these guys, I would want many years of production. That means Aaron or Mays. A good argument can be made either way but I would choose Mays over Aaron because I want the defense and speed. Player Hits Runs RBI Homers SB Avg. his players and the pitchers in order to get the best out of them. (his closer) in the 6th inning. Page shuts out the Red Sox for 4 innings (allowing them only one hit) to win the game. Stuff like that in a crucial play-off game you just never forget. such stories which would fill up numerous Net54 page of many exciting BB games (and events) which I recall from my youth. I'll leave it for another day, though. Like when he picked Turley over Whitey Ford for game 7 against the Pirates, and then used every other starter in relief instead of Ford. I think Stengel won because he had a stacked team and a farm team in Kansas City, not because of his strategy. 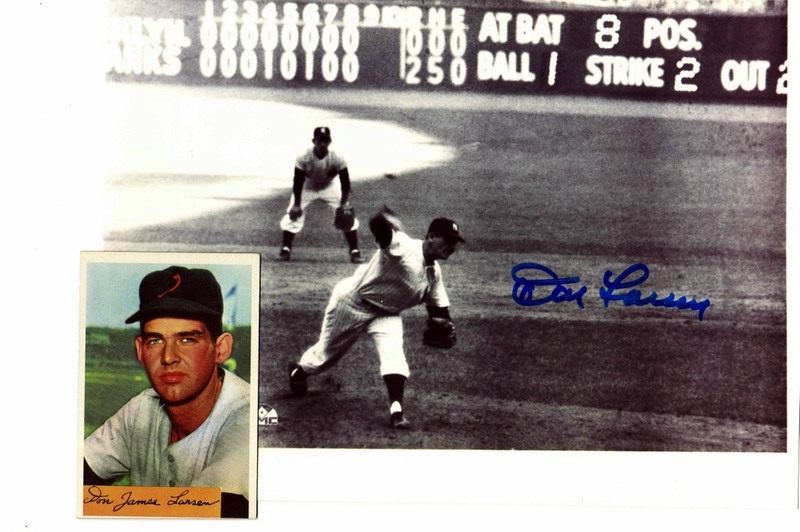 I have the audio recording of Larsen's perfect game in the 1956 World Series. The key play that saved it was Mantle's running catch of Hodges' shot to left-center. As Hodges comes to bat, the announcer mentions that Stengel climbs to the top of the dugout and waves Mickey over several steps. A couple pitches later, Mantle just barely saves the perfecto. Stengel truly was a great, great manager. The last thing I'll say on the topic is that my opinion is based on actual facts, history, and what Mantle did. The differing opinions, with all due respect, are based on conjecture, what ifs and mere possibilities. If you gave Aaron, Mays and Williams Mantle's team, there is no way anyone can say that they would've done the same.... Its possible, but there are no guarantees... No one can argue that. So it's just wishful thinking, nothing more. Mantle did it, those other players did not. Bottom line, I'm basing this on facts, not what might have been. The same can't be said for the differing opinions. My final word is this: Take a typical Yankee championship year. Plug in the production of Mays (or Aaron) for that same year instead of Mantle's, and the Yankees still win. And since Mays and Aaron took better care of themselves, their careers lasted longer and their total production was far superior. Last edited by Mark17; 04-14-2019 at 04:56 PM. Since we are only starting a team, rather than looking at postseason success, I would take Tris Speaker. He had the tools and intelligence to play in different eras and be great. All time doubles leader, incredible speed, outstanding defense, and as he got older he became a mentor to players - so he was one of those personalities you want in the clubhouse... early day version of Mike Trout. The Yankees in the 50s had a major league farm team in Kansas City (also in the AL) complete with a shuttle bus. Now that's depth. Last edited by frankbmd; 04-14-2019 at 07:26 PM. But I am torn. Behind Tris Speaker, I might make take Frank Robinson. MVP in two leagues. Intelligence that transferred to managing. Oct 8th 1956....believe it or not....I stayed home from school that day and watched the Perfect Game on our 12" TV . we wouldn't be talking about that unprecedented Perfect-No-Hit game that day. Not only did he save the day for Don Larsen, Mickey hit a HR in the 4th inning that went on to be winning hit. For Sal Maglie pitched a pretty darn good game for the Dodgers. A lot of people don't realize that Maglie retired the first 11 Yankees before Mantle hit that home run. So it was a duel perfect game with 2 out in the bottom of the 4th inning. So with that logic, you'd pick Whitey or Yogi or even Scooter over any other players of their time, since they 'did it'. Mickey was great, one of the greatest, but I'd still take Willie. But I couldn't blame anyone for taking any of the other choices. Last edited by Bigdaddy; 04-14-2019 at 06:19 PM. Apparently, Stengel was quite impressed with Maglie's performance that day, that the Yankees signed him up in the Summer of 1957. The final pitch....does a photograph of a significant moment in BaseBall get much better than this ? I've had a similar discussion with the Pastor at the church I attend. The fact that he grew up not only watching the Yankees, he also grew up in the dugout and locker room. After going back and for about great players in the 50's and 60's he point blank said that Mantle was the best player he had ever seen. He pointed out that Mantle played most of his career injured, but talent wise he said that nobody was better that he saw. So after this discussion and going back and forth on several players I will have to agree with him. From Jane Leavy's biography of Mantle. Q. Who was better, you or Mays? Great line about Willie from Leo Durocher, who immediately recognized his supreme talent -- "If he could cook, I'd marry him." Another Durocher/Mays anecdote. Apparently when Willie got the call to the bigs from Minneapolis he was extremely nervous and Durocher phoned him. After Willie explained he was afraid he might not be able to hit big league pitching, Durocher asks him, what are you hitting now? Willie replies .488 LOL. Durocher says, well son, do you think you can hit two bleeping fifty for me? Last edited by Peter_Spaeth; 04-14-2019 at 07:23 PM. The decades old question.....who was a better Centerfielder ? Willie, Mickey, or the Duke (Snider) ? In my opinion, since in during my youth I saw all three of them play, they were all great. they were classmates at Compton High (California) in the 1940's. Willie, unfortunately is not the nicest guy you want to meet, nowadays. And, this is a shame to his many fans who have idolized him for many years. And, Mickey....GOD Bless his soul. OK, here is the quiz.....what is remarkable about Mickey which sets him apart from Willie and the Duke in terms of achievement ? ? Williams did poorly in his one World Series. I think he was an amazing player, but Id have to accept that he wasn't exactly "clutch" at times. Mantle had a few good series, and a number of really poor ones. 1961, 62, 63 he batted under .200 and a few of the earlier ones weren't great either. Overall, he batted 40 points under his career average in the series. That's not exacly "clutch" either. Aaron in the WS batted 59 points above his lifetime average, and to eliminate the complaint that the lifetime average is reduced by the later part of his career, in 57 he was .393, 71 points above his average that year. in 58, .333 was only 7 points above that years average. So yes Aaron was more clutch than Mantle. He was playing injured; the week before the series started, he was hit in the elbow during an exhibition game. Besides, he crash landed a jet that the North Koreans put 250 holes in and walked away from it. I’d say that is far more “clutch” than anything that has ever happened on a ball field. Ok then, in 6 of his 12 World Series Mantle batted under .250. In two others he batted .250. I would say that in those 8 series his performance wasn't helping the team. in 1962,3 and 4 Tom Tresh outperformed him in the series. 1941 All Star Game. Two out, two on, down by a run, bottom of the ninth. Not only does Williams end the game with a home run, he absolutely crushes it off the facing of the upper deck in Detroit. 1941 September 28. With a chance to sit out the double-header and finish with a .400 average (which hasn't been done in the 77 years since,) Ted earns it, going 4-5 in the first game and 2-3 in the second game to finish at .406. 1960, also September 28, in his final at-bat, Ted does what he so very much wanted to do - he ends his career with a home run. Williams was injured in the 1946 Series, but too much of a man to alibi about it. It isn't fair to say that because he had one poor Series he wasn't "clutch." I knew about the plane, not about the injury. Well, if there was ever a player (and there was!) that could get from home plate to first base in 3.1 seconds and also hit a homer 565 feet, that would be the guy. If not him, I'd go with the greatest athlete ever to play MLB, a healthy Bo Jackson. Those two, when healthy, were the most exciting players ever IMO. Since the original question was about who we'd pick starting a team today. I have doubts about Willie and Mickey standing up to the sort of access and scrutiny the players today have to deal with. Aaron was maybe just a bit too reserved, but would be in the running. Griffey maybe just a tiny bit behind. A big piece of todays game like it or not is PR and image, and so far Trout has got it just about right. We can splice and crunch numbers on and on about how a player did in a season, and especially a World Series. It's important, but it will not likely change anyone's mind about how they feel about how great or crummy their hero was at a given time. You bring up Ted Williams getting hit by a pitch in a stupid exhibition game to keep the Sox sharp, while an NL playoff was being fought. That was most unfortunate, since it would be his only World Series. Then again, in '48-'49 Ted had terrific years, but failed at the crucial last game / games, respectively. Stan Musial did not tear up the pea patch in the Series; neither did Ty Cobb or Jackie Robinson. Mickey, as you said, had some sour World Series performances. He was injured in '55 and '61 going into the World Series. He injured himself playing golf with Tom Sturdevant in '57, when he was at his baseball peak. Mick hurt his shin badly during that golf match; I won't go into a lot of details, but Sturdevant's high-pitched laugh afterwards made Mick lose his temper on a branch in his way. The branch was actually dead, and swinging his putter at it with all his might and anger, the putter went clean through the branch and into his shin. OUCH times ten to the third power! Then, a month and a half later in World Series game 1 I believe, Red Schoendienst fell on Mickey's shoulder in a close play at second. The pain from that hit was horrible, and Mickey said as a result, he was in pain until the beginning of 1961. Yep, Mickey had a lot of great-to-good players around him during his hey day, as did Babe and Lou. Isn't that just too bad, for you who dislike him. Or you, who constantly shame him for not taking better care of himself, even though the man literally thought he'd only live to be as old as his dad that died at 39. I go back to what former teammate Hank Bauer said, that the man did awfully good even with all the injuries he had. He was the man. He was the big guy. He was the warrior to be feared. Almost all eyes were on Mickey Mantle at the ball game. You're right about Tom Tresh--he was the only Yank who got to Sandy Koufax in game 1 of the '63 Series. He got to Gibby in '64, and he was the hero of '62 indeed! 'Course, none of the Yanks did well at the bat in '63, though Mr. Koufax threw one that Mickey liked in game 4 that he crushed into Chavez Ravine. Furthermore, HE MADE HIMSELF PLAY HURT MANY GAMES IN WHICH HE SHOULD NOT HAVE BEEN IN THE LINE-UP. Why would he do that? I read about this. I teared up good. 'Cause he knew there'd be a bunch of kids in the stands that were attending what might be their only game of the season to see the Yanks. And, they wanted to see one player more than any other----Mickey Mantle. Mickey did not want to disappoint a kid, and let him down. Regardless, he played. He had the trainer wrap him up like a mummy as he had to do for a decade or more, and played anyway, and gave it his best anyway. Then, when number 7 walked out of the dugout with a bat to go to the on-deck circle, everybody got excited. The excitement and anticipation grew and grew, and then, when he stepped in the batter's box, just about everybody's eyes were glued on Mickey Mantle. What was he going to do? In a few days, another anniversary will go by of a significant event that occurred April 17, 1953 at Griffith Stadium in Washington, DC. Up in the stands were a father and his 20-year-old-son, plus just a few thousand other fans. Guess the home-town Washington Senator fans figured the Yanks would beat their team, and they guessed right. But they missed it. Boy, did they ever miss it---Mickey slugging a Chuck Stobbs fastball 565 feet!!!! Made a huge impression on every player, fan, and pressman who was there, including the young man and his dad. That young guy thought an awful lot of Mickey, and one day became famous himself, as a country and western singer and guitar player---Roy Clark. The two later connected, and Mickey had asked Roy to play his signature song at his funeral, "Yesterday When I Was Young". Mickey Mantle must be special to me. I put a 3-card spread of him on the cover of my E-book on a CD, Never Cheaper By the Dozen. Last edited by brian1961; 04-16-2019 at 12:00 PM. Out of all the players I`ve ever seen, let`s say 1966 and on, would start my team with Johnny Bench. From the original list toss up. Ummm...he drank more beer than Willie and Duke put together?? 1. He was a switch-hitter. Besides Eddie Murray, the best switch-hitting power hitter in baseball history. 2. He was the best bunter, and could drop one down for an infield hit almost whenever he wanted. 3. As good as he was on the field, his best work was done after he retired, with his honesty about his bad habits, addictions, and poor choices. He really turned the negatives in his life into teachable moments for millions of people. 4. His quick thinking while at first base, avoiding being doubled-up in the ninth inning of Game 7 of the 1960 World Series was the single best instantaneous reaction to an unusual situation ever seen on a ball field. 5. His baseball card prices almost single-handedly lifted the value of all baseball cards, and gave birth to the idea that a players' "rookie" card should have inordinate value. Last edited by Mark17; 04-15-2019 at 09:44 PM. However, the answer I'm looking for is much "deeper" than the usual stats, BB card factors, etc. I'll continue this subject tomorrow evening. Watching a rerun of The Rifleman the other day and The Duke was one of the bad guys! Even had a few lines..... but like all the others who come up against Lucas McCain he bit the dust by the end of the half hour. Well, Mickey of course. He did it all. If I'm starting a team today to play today, I'm picking Trout every time. We discuss the modern game and who would be a star in it all the time. Why would you pick anyone other than the best player in the modern game, if not the best player of all time. Nobody pitching to Mickey had anything to go on other than anecdotes. Hard to say what effect modern analytics would have had one him or Ted or anyone else. But we know what Trout can do. Last edited by packs; 04-16-2019 at 08:16 AM. There are all those world serieses!! He has gone largely unappreciated but IMO the best catcher of all time. I once saw him throw three straight times to first and on the third picked off the baserunner. Remarkable arm. As an outsider on the baseball side, its interesting to me that I haven't noticed a single argument that used sabermetrics. My understanding is that field devalues most traditional statistical measures like RBI in favor of new ones like WAR. Philosophically, I've even heard it argued that there is no such thing as clutch. I would have thought there would be some crossover between collecting and sabermetrics especially among those posting in this thread on a non-collecting topic. Last edited by TanksAndSpartans; 04-16-2019 at 09:50 AM.